With that, Her Holiness Sai Maa turned and went into the hotel. I was standing in front of the hotel on the Izu Peninsula in southeastern Japan, about a four-hour scenic train ride from Tokyo. It was December 28, 2017 and the night before I had shared with Sai Maa several pages of logos for the new movement we were creating called Awakened Life. We wanted something that both represented the ancient ties with spirituality and Sai Maa’s spiritual lineage, as well as the modern expression and relevance of this transformational work in today’s world. One of the proposed logos I had shared with Maa was an enso. 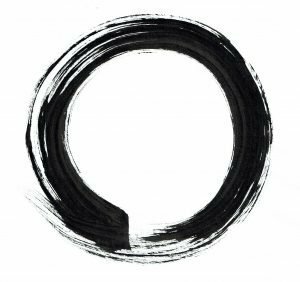 An enso is a brush painting of a circle, done for thousands of years in Japan. Simply put, it represents the pursuit of perfection and the circle of life. Standing there outside the hotel, I had been contemplating a large framed enso painting done by one of the great artists in Japan. Our graphic designer then took the enso and went to work on the Awakened Life logo. We wanted to bring a vibrancy to it, a uniqueness that we offer in Awakened Life, powered by the energetic master Sai Maa. To do this, we decided to bring in color—not just any color, but colors emanating from, originating from the source of all that is. At the center of the Awakened Life logo you will find a bindu. A bindu represents the Divine Mother, the source of creation, that moment of transition from the absolute stillness or emptiness of all that is as it emerges into the manifest world from which everything else comes. That point, or origin, is called the bindu in vedic culture. It is often depicted in red form, also representing the root or muladhara chakra at the base of our spine. The divine mother energy lies dormant in us, awaiting the time to arise and bring her full power and glory into our lives. 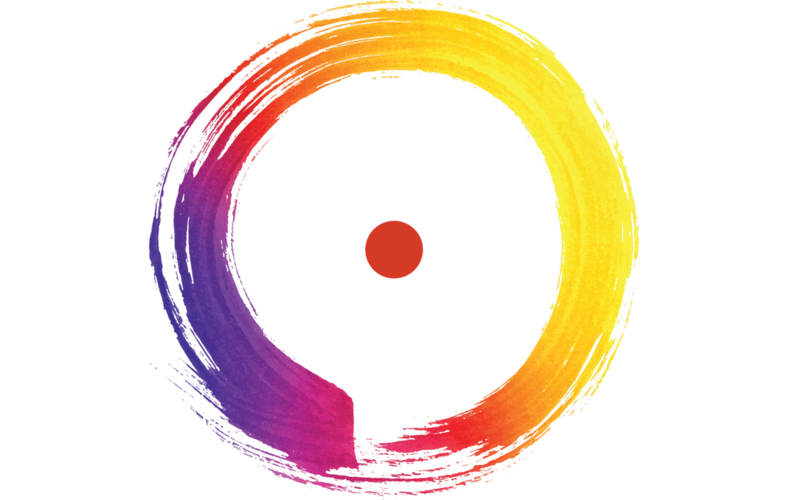 Emanating from this point of origin, the divine mother, we decided to have radiating colors in the enso, bringing that activating, enlivening, awakening energy to life, represented by the circle. You will also notice it is a not a perfect computer drawn circle, but an imperfect circle representing the fullness, the richness, and the dance of life. We then went to work on determining the colors to include in the enso. We wanted something vibrant and alive, something that, when someone looked at it, their brain lit up—an awakening happening simply through the colors and the design. We decided to go with the yellow, orange, red, blue, purple spectrum where each color represents a facet or element of the Awakened Life movement. You can see this reflected throughout our website. Purple, representing the teachings and the institute holding all of our programs. The red, fire, our sacred fire ceremonies known as Yagyas. Yellow, the vibrancy and life-giving force of community. Blue, our products, the Awakened Life Boutique. And orange, our affiliates, those partnering with us to bring forth Awakened Humanity. All together, the circle, the bindu, the colors, and the typeface in a modern font represent our movement, Awakened Life. The bridging of east and west, ancient and modern. Now, this exploration would not be complete without the energizing factor. Awakened Life is powered by Sai Maa. And Maa has specifically spoken of how Maa is activating this logo, as well as the website awakenedlife.love to uplift and enliven the consciousness of anyone looking at it. 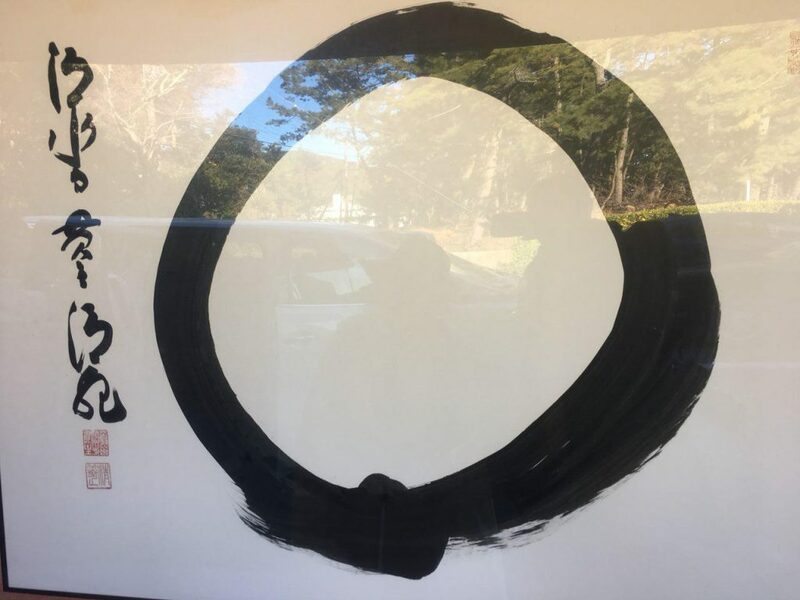 So yes, Maa was speaking about the enso I was looking at, framed outside that hotel in Izu. That was a beginning then, and now is another beginning. The Awakened Life movement is officially open…open for you to step into and join us as part of this global awakening that we are ushering in—where that synchronicity and magic of life, just like I experienced that day in Izu, can be activated and brought into each of our lives.